Just as I said a few days ago when you saw it in front of Lorca: that awful-looking bike parked in front of Pacific Swim Bike Run deserves an explanation. But you’ll have to wait. This is still DIYBIKING.COM’s #GiftsForCyclists special and it can’t be slowed down. 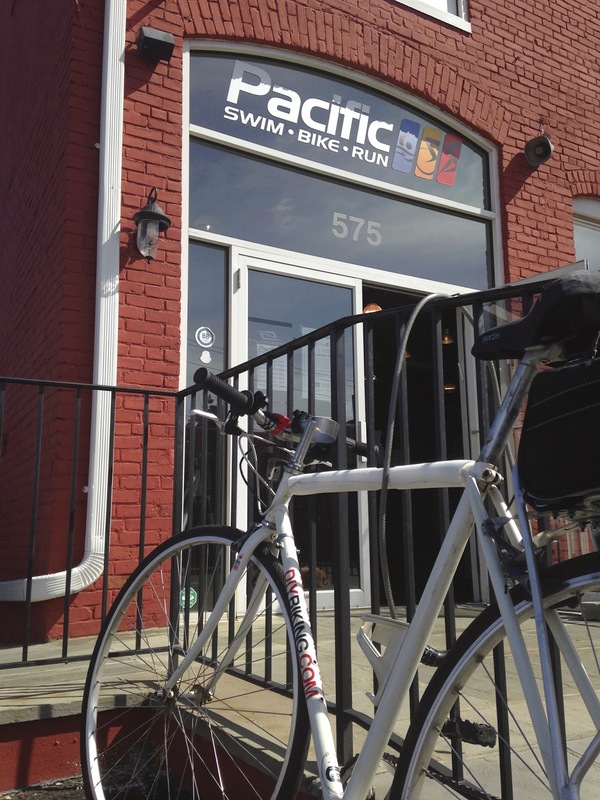 On 575 Pacific Street in Stamford, you’ll find Pacific Swim Bike Run (the same shop that created the Hot Chocolate Classic to benefit The Pacific House Shelter for the Homeless a few weeks ago). On paper, it’s supposed to be a shop I’d normally avoid. It specializes in bikes that are fast that are bought by people who want to go faster and after riding argue with their friends over who was the fastest. But it’s not that. It’s a fun, non-intimidating place to shop or take a class. Even though I have mostly skinny tire bikes in this shot they also have a well curated selection of children’s bicycles and gear. And they carry a few bikes that would cause any cyclist’s eyes to light up on Christmas morning. This got my attention walking in the door. Like the beautiful custom bike that BikePort is raffling off it is just an outstanding color. Don’t you just want to hang it on your tree? Now you can buy this or any other bike here for a cyclist this Christmas. Because the shop is less than a ten minute walk from the Stamford railway station, New York City friends reading this can make an easy trip here to do a little Christmas shopping - possibly for themselves. What’s taught in this period of time is up to the cyclist: it can be as simple as fixing a flat, replacing a bottom bracket, brakes and drivetrain adjustments - any wisdom a cyclist wished they had before they had ruined a perfectly good shifter when building a mountain bike. So if the cyclist you’re shopping for is long on toys but short on how to maintain them, visit Pacific Swim Bike Run and give the gift of Wrench Smarts. Ask about getting this at the PSBR front desk or contact them at contact@pacificsbr.com or 203-504-8960. Thanks for reading and thanks for riding. * or James Bond hiring out Q, if you prefer.